Fish Rock is, of course, famous for its cave. Nearly every one who comes here wants to dive Fish Rock Cave. The cave is actually a tunnel, in that it goes all the way through Fish Rock. The cave is about 120 metres long and runs roughly east to west. The eastern end is the shallow entrance and where most divers are taken, at least on their first dives here. This is primarily because it is much shallower at about 10 metres, although you have to go to about 17 to 20 to get there from the moorings. 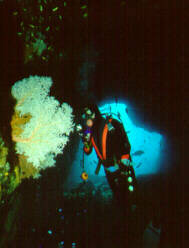 A lot of dives to the cave go in and out via the shallow entrance. As mentioned above, Fish Rock Cave, of course, has two ends. 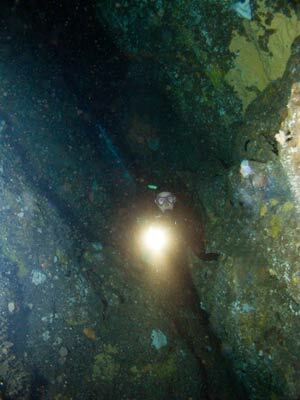 The deeper end of the cave is covered in another article called Fish Rock Cave - Deep Entrance. 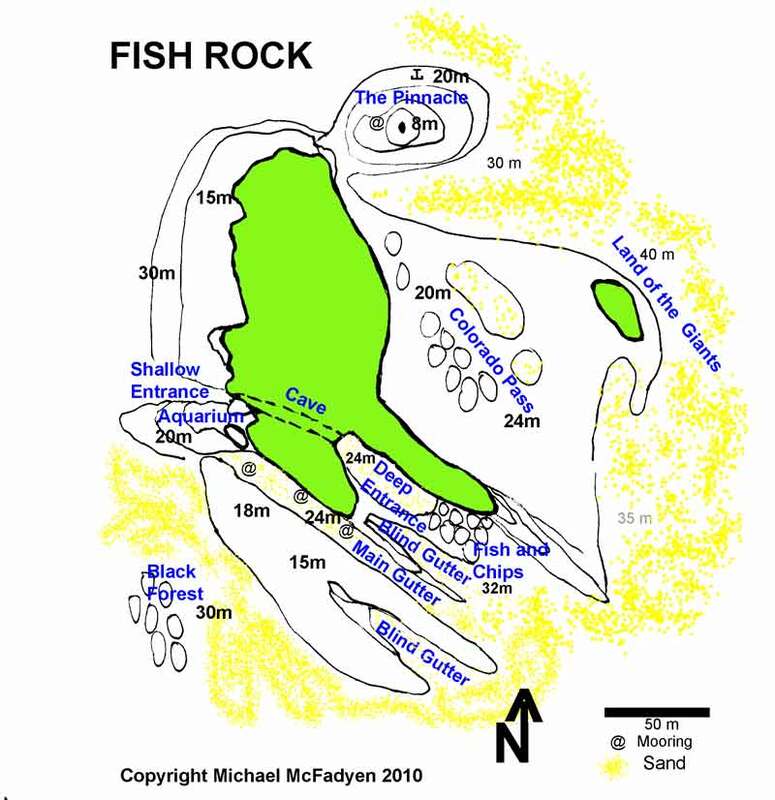 As I have mentioned in other articles on this site, Fish Rock is very often affected by a current from the north, but I have seen it come from the south on rare occasions. When it is running, it is normally so strong that diving the shallow end can be dangerous, or at least very difficult. However, when the current is absent or at a minimum, the shallow end of the cave can be safely dived. On these occasions, you can swim around from the mooring on the southern side of the island and then go into the cave this way. The mooring has a GPS Reading of 30° 56' 27"S 153° 05' 57"E (this reading was taken with a map datum AUS66 - if you use any other datum, you will need to convert it - see GPS Page for more information). Once you drop to the bottom of the mooring, head to the north-west along the gutter. Do not spend too much time here now as you can do this on the way back. At the end of the gutter, veer to the north and go pass the boulders. Keep to about 15 to 20 metres. After a while you will come to a ridge that runs from higher up to your right and drops away to the left. Cross over this ridge and you will be now in the gutter that leads up to the Shallow Entrance. This gutter can often contain grey nurse sharks, especially when there is little current around the island. The gutter has a sand bottom deeper and this becomes pebbles and then rocks. The depth comes up to about 10 metres at the entrance. In the entrance to the cave you will normally find thousands of ladder-finned pomfrets. These hang around this area, only moving for divers and sharks. Once inside the cave, head into the dark expanses. As you go you will see heaps of wobbegongs, crayfish by the dozens (hundreds?? 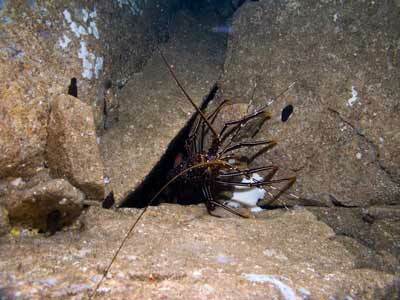 ), slipper crays and sometimes one or two very large black rays. Also keep an eye out for the small sea cucumbers that are all over the walls. These extrude a gooey substance that sticks to wetsuits and gloves and is very hard to get off. The cave runs in about 90 metres, at a depth of between 7 and 15 metres and is about two to four metres wide. At the 90 metre mark, there is the first of two chimneys that drop to the Deep Entrance of the cave. This entrance runs back about 20 to 30 metres to the sand gutter which is about 25 metres deep. From this spot above the chimneys you will be able to see light from the eastern end as there is a very narrow exit out here (but I am pretty certain that you cannot exit out there). Normally you would turn around before the chimneys and head back. As you go, look for the two air pockets, one at the shallow end and one above the vertical chimney near the deep end of the cave. These are about 5 metres below sea level. 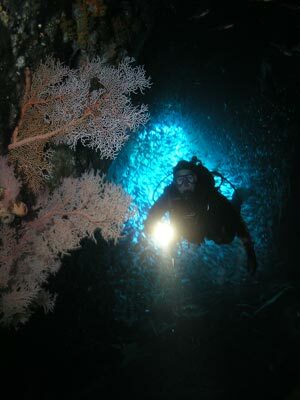 When inside the cave, the pressure from larger seas can cause dive computers to continually sound (the computers think you are ascending too quick) and if you go into one of the air pockets, the air fogs up then clears and then fogs again due to the changing sea pressure compressing the water moisture out of the air. Just inside the shallow entrance of the cave there are a number of excellent gorgonia fans that must be the most photographed fans in NSW, if not Australia. The sight from here is one not to be missed. After exiting the cave you can follow the rocky pile down a bit deeper where it turns into a shell floored gutter that runs to about 18 metres. Depending on current, you may not be able to go past the "dune" where the floor drops away steeply. There is considerable fishlife in the gutter, including grey nurse sharks, wobbegongs, firefish and leatherjackets. When you do this, you can spend considerable time either before or after the cave looking at the western wall area. 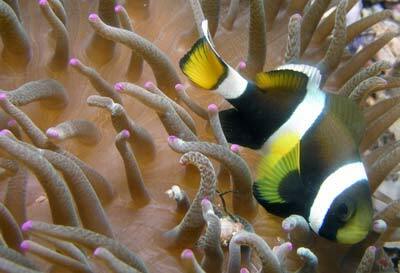 There are numerous anemones and clownfish in this area (very small but growing in size and number). The anenomes have only been here since about 1992 or 1993 (personal comment from the late Noel Hitchins who ran daily charters there for more than 20 years) and the clownfish are even more recent arrivals. Other things to see are firefish and sometimes, turtles. There are green and loggerhead turtles resident around Fish Rock, ranging in size from 300 mm right up to huge 1.5 metres whoppers. After this you can explore around to the mooring, both a bit deeper and up against the island. Close to the island is the Aquarium where you can normally see huge quantities of fishlife and nearby is the Turtle Hole where there is normally a resident loggerhead turtle. There are normally heaps of kingfish swimming around as well as surgeonfish, eastern rock blackfish, drummer, bream, leatherjackets (many species) and some tropical species like butterflyfish and firefish. All in all, an excellent dive if the conditions permit you to dive it as I have described. Visibility in the cave is generally 30 to 40 metres (that is, quite okay!) and outside up to 30 metres. 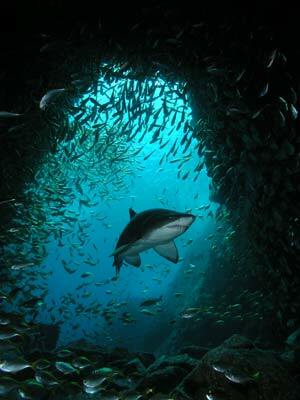 For more photos of grey nurse sharks at Fish Rock, go to the Fish Rock Grey Nurse Photo Page. I can recommend the services of South West Rock Dive Centre. They can be contacted on 02 6566 6474, fax 02 6466 6959 or email.